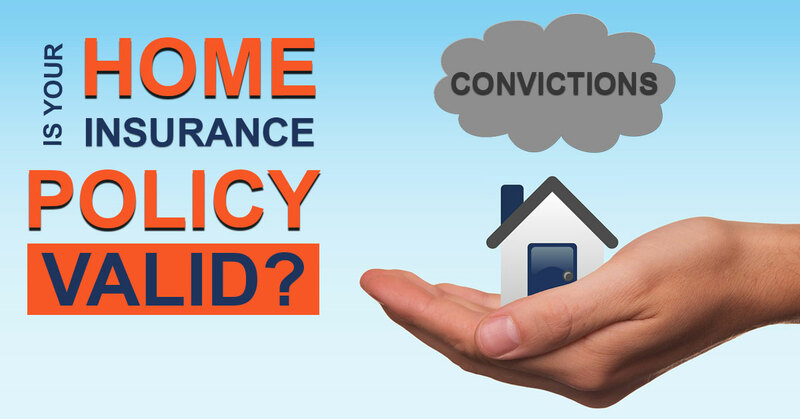 Are you aware that your home insurance policy may be void if someone in your home has a criminal conviction? If you answered no, you are not the only one. Obtaining home insurance with an unspent conviction is challenge enough, but many people are unaware that the issues surrounding criminal convictions and insurance do not only apply to the person making the insurance application; they also apply to everyone living in the property, whether they be family members, lodgers or tenants. As a result, many householders in the UK are discovering the hard way that their home insurance policies are worthless, not because of their own past, but because of past mistakes made by people living in their homes. If you have someone living in your property who has an unspent criminal conviction and you havenï¿½t declared this information when you set up your home insurance cover, it may render your policy void and invalid. If you are worried that your home insurance may be invalid, or if you are struggling to get home insurance because of a conviction, we will be able to help. Give our friendly team a call today on 0161 969 6040, email us, or click the button below for a competitive, no-obligation quote. Figures from the Home Office reveal that as of April 2017, there are over 11 million people in the UK who have a criminal record(1), including approximately 730,000 people with unspent convictions. Most convictions remain unspent (in other words, they must be disclosed to employers and insurance providers) for at least five years. The length of time necessary for a conviction to be deemed spent is dependent on the sentence imposed by the court at the time of the conviction. Problems arise when insurers fail to ask sufficiently explicit questions about the applicantï¿½s convictions, or about the criminal records of people residing in the home. This is especially true online, where some insurance providers bury questions about past offences on a page only accessible by pressing a discreet 'assumptions we make about you' button, which is easily missed or simply ticked without understanding what you are accepting or agreeing to. The BBC One documentary "Inside out" highlighted how many people in the UK are facing large bills due to undisclosed minor convictions, or because someone living in their home has an unspent criminal record. The series discusses the story of Michelle Barber, whose home was destroyed in a fire in 2007. She is now facing a bill of almost a quarter of a million pounds due to her failing to disclose a ï¿½150 fine she received three years earlier for unknowingly giving the benefits agency incorrect information. Michelle said "I hadn't realised such a minor fine counted as a conviction," she says. "I wasn't arrested, the police weren't involved, and I'd simply forgotten about it by the time I took out the insurance." On claiming on her home insurance, Michelleï¿½s insurance provider paid out over ï¿½50,000 which enabled Michelle to move back into her home. However, a few months later, she received a demand for the money back due to the fact that she had not previously declared the ï¿½150 fine. She said "I was shocked and felt sick. Why did no one tell me such a tiny fine could do this? Why didn't the insurance company make it clear what they needed to know when I took the policy out?" The insurance company however are insisting on repayment, claiming that she was given the chance to declare the conviction, but refrained from doing so. If you have ever rented out a property, you too must be aware that insurers need to be informed about any convictions your tenants may possess. Failing to do so could render your policy void. A lot of private landlord are probably unaware of the necessity to request this type of information. How long do I need to declare a conviction? The Rehabilitation of Offenders Act 1974 (ROA) allows for most convictions to be classed as ï¿½spentï¿½ after a set period of time (this period of time depends on the conviction). Once a conviction is ï¿½spentï¿½, it is no longer necessary to disclose it to an home insurance provider. The length of time necessary for a conviction to be deemed spent is dependent on the sentence imposed by the court at the time of the conviction. However, some convictions that resulted in a prison sentence of 4 years or more never become spent and will always need to be disclosed to your home insurance provider. How do I know what to declare? Some motoring convictions (speeding fines, parking fines) do not have to be declared, however, fines for dropping litter may have to be declared and could even prevent you form obtaining home insurance from mainstream insurers if the conviction still remained unspent. If in doubt, always speak to your insurance provider to make sure you have ticked every box and that your insurance will remain valid in the event of a claim. I'm not sure about my home insurance, what can I do? If you are worried about your home insurance policy, or if you or someone in your home has an unspent conviction and are struggling find affordable home insurance, contact SIS today on 0161 969 6040. We specialise in non-standard cover and our experienced and friendly team will be able to help you. If you would like a quote for home insurance, please click the button below for a competitive, no-obligation quote.